X-rays have been a function of dental healthcare for a long time. That in and of itself should be good news, because it means we've had plenty of time to improve them. While there is always some risk in exposure to radiation, dental X-ray exposure has decreased significantly due to all the advances in technology. So there’s risk, but X-rays are quite safe. Think of X-rays as you would about a car. Automobiles these days have all kinds of technology to make them as safe as possible. There's still a chance that you’ll suffer an accident. Would you stop using a car because of that risk? When it comes to dental X-rays, Dr. John Witte and our team believe the positives clearly outweigh the negatives. X-rays can be done digitally or with film. For film, X-rays require different exposures at different speeds to produce the image. Digital X-rays have software that automatically adjusts the exposure and produces the X-ray in a digital file. 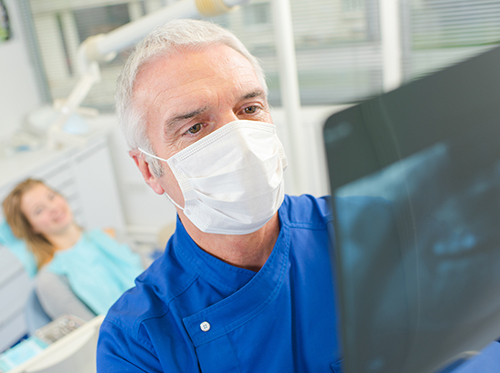 Since they substantially reduce your exposure to radiation, digital X-rays are the current standard in dental offices. In addition to digital X-rays, lead aprons are an essential piece of X-ray safety. They help protect internal organs from X-rays by acting as a shield. They usually come with a thyroid collar as well, since that is one of the most vulnerable areas to X-rays in the body. Lead aprons can absorb up to 95% of any scatter rays that result from an X-ray. Not bad, right? Although dental X-rays involve some radiation exposure (not all of it can be eliminated), so does everyday life. Getting too much sun, for example, can be dangerous. The truth is, we accumulate radiation in our bodies over a lifetime, so it’s worthwhile to be aware and avoid as much unnecessary exposure as possible. When it comes to your dental health, though, getting an X-ray — especially when your doctor says you need it — offers more benefits than risks. Ask us about the type of dental X-rays we use during your next visit to our Arlington, TX office!